Literally the day I write a blog post mentioning a desire for a “taunt kills” strange part, Valve releases one! And that’s not all; some very interesting changes have been made to the trading metagame. 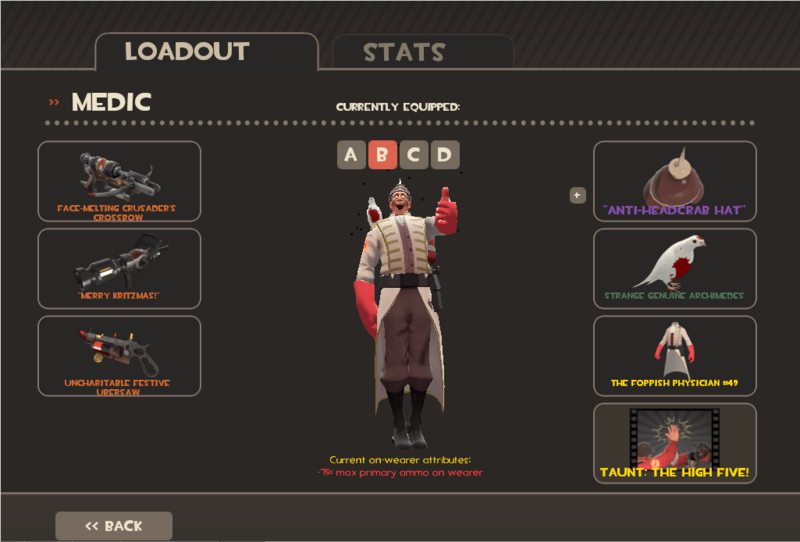 You can now use “Chemistry Sets” to make strange cosmetics items which track points scored. On one hand, I question the use of such things when nobody will see a cosmetic in a deathcam, plus points are largely irrelevant, but on the other hand Strange Genuine Archimedes. Step 1: A player obtains a Chemistry set somehow. He wants the strangifier. Step 2: He obtains a bunch of unique weapons and a strange (or a sizeable chunk of regular hats). Step 3: He crafts those items into a Strangifier, meaning those ingredients no longer exist. Step 4: He consumes the strangifier by making an already existing item strange. Sorry for the short post; currently flying to Ohio for a week. Theories on the recent addition of Strange Cosmetics (Blog posts about Strange Parts: 1) Move Those Weapons… Up… I Guess… The New Popper-Cola Combo That new Valve blog post.